The Attiko Metro connects Athens' international airport, Eleftherios Venizelos, to the city. Fares are around $9. 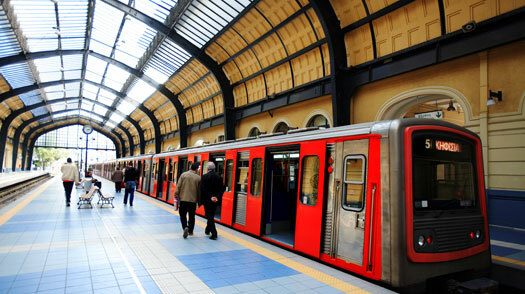 It's about a 40-minute ride to central Athens, and the station is easily accessible from airport terminals. Taxis to the city center cost upwards of $52, and you can expect to pay double after midnight. The Attiko Metro is quick and cheap. 24-hour passes (also valid on buses) cost $4.50. Bring a passport photo if you plan to buy a weekly ($15). The city has no single sightseeing pass, but the Acropolis ticket, valid for 48 hours, allows entry to all of the sites on the World Heritage  listed hill. If a restaurant bill does not already include a service charge, it's usual  but not really obligatory  to tip about 10% to 15% on top. Taxi fares should be rounded up by a euro or possibly more, according to the total amount. Meanwhile, it's customary to leave some small change for attendants at cloakrooms and restrooms. Athens is known as one of Europe's safer cities for tourists, although, as in all major destinations, pickpockets do exist. Exercise appropriate caution.